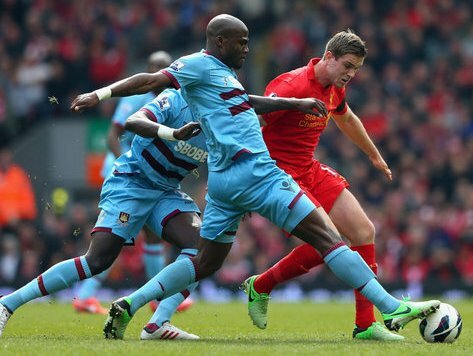 Liverpool's top-six hopes suffered another crushing blow as they failed to break down West Ham's stubborn defences. Three weeks after that dismal defeat at Southampton, Brendan Rodgers' side once again failed to spark, skipper Steven Gerrard coming closest to a winner when his effort was cleared off the line by the outstanding James Tomkins. But the Hammers, for whom James Collins was equally impressive, also had a claim on the spoils, with Lucas Leiva denying them a first Anfield win in 50 years when he turned away Jack Collison's header five minutes from time. The contest was preceded by an impeccably observed minute's silence in honour of the Hillsborough victims, for whom so much time and effort has finally received its reward. Yet, for all the memories of those 96 lives so horrifically lost in South Yorkshire, Liverpool must also deal with the present, which means somehow clambering back towards the heights the club scaled so often back then. A rather complicated scenario for European qualification is unfolding, in which finishing sixth in the Barclays Premier League might be enough. It is not one Liverpool can afford to rely on though, which means an all-out assault on the top five. To that end, a home encounter with a side who had not scored at Anfield since 2006 and have to go back half a century for their last victory should have been perfect. Except this was one of those days Rodgers must have been referring to when he outlined in his programme notes that "from outset of this campaign, I felt it would most likely be a season of transition and there would come a few growing pains". For with top scorer Luis Suarez not quite on his A game, the hosts struggled to break down an obdurate West Ham outfit. Philippe Coutinho brought a decent early save out of Jussi Jaaskelainen, who also denied Stewart Downing before injury forced the former Middlesbrough man to give way to Daniel Sturridge. But it was not until Coutinho found Suarez with an excellent return pass inside a crowded penalty area that Liverpool really came close, this time Jaaskelainen repelling the effort with his legs. Denied the services of Andy Carroll, who was prohibited from facing his parent club, West Ham were prepared to live off scraps, knowing even a point would be valuable in easing their relegation concerns. Yet they gave the impression of a team who, with a little bit of conviction, could achieve much more. Mohamed Diame wriggled free of three Liverpool defenders before driving his shot over, whilst Carlton Cole should have done much better than drive an effort straight at Daniel Agger after Lucas had been rushed into an error. Liverpool got better after the break without making that crucial breakthrough. A claim for handball against Collins when he got in the way of Agger's thunderbolt came mostly from the Kop and referee Anthony Taylor was unimpressed anyway. Gerrard almost set up Sturridge before being presented with the clearest chance of the contest when Suarez's shot rebounded into his path off Guy Demel. The Liverpool skipper could not quite pick his spot given the number of bodies in his way. In the context of this game though, it was a golden chance, which James Tomkins superbly turned off the line as the home fans were about to start celebrating. Suarez then fizzed a shot across goal that went through Jaaskelainen's legs and flicked off the far post, but brought no reward. West Ham were being extended to a much greater degree. Yet they remained a sporadic threat and might well have had a spot-kick when Jose Enrique caught Tomkins in the box. Tomkins found himself at the centre of another key moment as he appeared to bring down Gerrard, who had cut inside the Hammers defence. It would have been a certain penalty had it not been for Tomkins managing to get his foot on the ball before sending Gerrard sprawling. Gerrard curled another effort over as time began to drift away, and only Lucas' fine goal-line clearance from Collison's header prevented Liverpool from being sunk completely.